CONTROL analyst Maxwell Smart (Steve Carell) dreams of one day being a field agent. Though he has just passed the field exam, he is too valuable as an analyst to get promoted. However, when the identity of all of CONTROL's field agents are compromised, Max finally gets his shot to prove what he can do. He is partnered with Agent 99 (Anne Hathaway), who luckily just had facial reconstructive surgery, keeping her identity secret. Together, they must try to stop an imminent attack by the terrorist group known as KAOS. 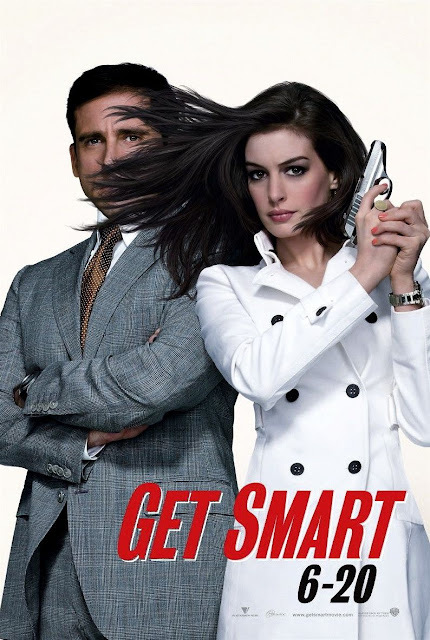 Directed by Peter Segal, "Get Smart" is the silver screen adaptation of the television show of the same name. It is not a direct remake, it's more like an indirect sequel, much like the movie "Dragnet" from back in the 1980's. It exists in a world where the events of the television show have already taken place, and we are simply picking up the story years later with updated technology and situations. It is not necessary to be familiar with the show to enjoy the movie, and since we didn't ever watch "Get Smart," we're glad because we really enjoy the film. Steve Carell does a great job as this new, higher tech version of Maxwell Smart. He is someone who is very intelligent, yet socially awkward. He is a bit of a bumbler and gets flustered easily, but he always remains charming. Carell has always been an excellent casting choice for this style of role, and here, he is able to bring a lot of laughs with his sometimes dry and straight-faced delivery. Smart is also extremely dedicated to his job and is not afraid to give it his all in the name of success and bringing down the bad guys and gals. Anne Hathaway plays straight-woman to Carell's buffoonery. She is the talented, high skilled Agent 99, who doesn't think much of the inexperienced Maxwell Smart. The two of them are thrust together when the identities of all other CONTROL agents are compromised. They must find out where a terrorist attack is supposed to happen and prevent a bomb from being blown up somewhere on the planet. Hathaway and Carell have surprisingly good chemistry as partners. When Agent 99 doesn't believe in Smart, it only makes him work harder to prove her wrong. The romantic aspect of their storyline, well, we believe this to a lesser extent. We wish the writers of this movie would have thrown this portion of their relationship away because, to us, they work much better as just partners. The other actors in the film include Alan Arkin, who plays the Chief of CONTROL. Arkin is one of our favorite actors, he offers up some quippy, fun dialogue as the Chief. Dwayne Johnson plays Agent 23, the physically buff, mentally tough idol of Maxwell Smart. Agent 23 uses his charm and charisma to make both Smart and the audience smile at his antics and muscles. Johnson, of course, is perfect for the role. David Koechner and Terry Crews play Larabee and Agent 91. They are the muscle-head jock types and get their kicks by picking on the other nerdy analysts. Terence Stamp lends his brilliant acting chops as the villainous leader of KAOS, Siegfried. He is also the perfect casting choice. Who better to play a cold English villain than Stamp, who is probably a cold English villain outside of acting? Finally, there is James Caan, who plays the President of the United States and is a clear parody of George W. Bush, who was in office at the time of the film's release. Caan gives an equally bumbling performance as Carell, but in a much smaller capacity. With a great cast, some impressive action, and a lot of laughs, "Get Smart" is at the very least fun time, even if it slips into being a little over-the-top with its silliness. It's not a movie that will make you think very hard, it only asks that you give it a chance to make you chuckle at its spy-centered jokes and plot. One year ago, we were watching: "Pitch Perfect 2"